The brilliant planet Venus will shine near the bright star Regulus in the evening of July 9, 2018. 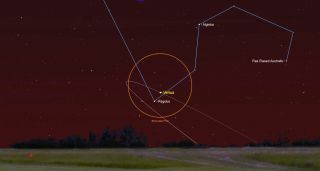 This SkySafari map shows the location of Venus and Regulus at 10:10 p.m. local time from mid-northern latitudes. During the next week, Venus, the most brilliant planet, will rendezvous with two bright objects. First, on the evening of Monday, July 9, it will slide past one of the 21 brightest stars in the sky. Then, on Sunday evening (July 15), it will make for an eye-catching sight with the moon. The first celestial meeting will be when Venus aligns with the blue-white star Regulus, the brightest star of the constellation Leo, the Lion. Six stars in Leo form a large backwards question-mark shape, popularly known as the Sickle. Regulus is at the end of the handle. It was one of the four "royal stars" which were supposed long ago to rule over the four quarters of the heavens. On the list of the 21 brightest stars, Regulus is number 21, but at least it's on the list. Look low toward the west around 9:45 p.m. local time. In late twilight, both the planet and star will be readily visible to the unaided eye. The difference between the two is considerable: Venus will outshine Regulus some 158 times; binoculars will enhance the view. On July 15, 2018, Venus will shine near the crescent moon, with the bright star Regulus nearby, as shown in this sky map. Then, on July 15, comes the second meeting, this time with the moon. The moon will be 3.5 days past new phase; a slender crescent just 12 percent illuminated, sitting to the right of Venus. For those in the eastern U.S., they'll be separated by just over 2 degrees by mid-twilight. But for those in the western U.S., the view will be more striking, because they'll appear half as far apart. Regardless, both will attract attention, calling even casual observers to look at them as they descend toward the west-northwest sky, finally setting at around 10:30 p.m. local time. As was the case with Regulus, binoculars will enhance the view of Venus with the moon. You'll no doubt notice Earthshine – sunlight reflected from off of the Earth toward the moon, which will faintly illuminate its dark part with a greyish-blue glow, seemingly imparting a three-dimensional effect. Near the start of this year, Venus was situated behind the sun at superior conjunction (on Jan. 9) and entered the evening sky, yet it was hidden from our view for many weeks due to its close proximity to the sun. But Venus rapidly climbed out of the bright evening twilight during March, becoming by far the most brilliant of all the "stars," and by mid-June it stood nearly 30 degrees above the sunset horizon and was setting 2.5 hours after the sun. Since then, Venus has taken a track placing it increasingly to the south of the sun's path across the sky. The result of this is that although its angular distance from the sun continues to increase, this is balanced out by its southerly track, which in the coming days and weeks will actually cause it to become progressivelylower in the sky and set gradually earlier relative to the sun. As such, compared to now, Venus will actually be noticeably lower in the western evening sky at its greatest elongation (46 degrees) on Aug. 17. Come the start of October, it rapidly sinks, appearing as an increasingly large, thinning crescent through telescopes and steadily-held binoculars. While less of its surface will be illuminated, Venus's angular size will increase as the planet approaches Earth in its orbit. At mid-northern latitudes, skywatchers will have to struggle to catch Venus very low in the west-northwest soon after sunset during the opening nights of October. It falls past the sun on Oct. 26 – well south of it (6 degrees) at this inferior conjunction, so any chance of trying to get a glimpse of it on those evenings and mornings of adjacent days will be solely for those who reside south of the equator, in the Southern Hemisphere. But during November, Venus will dramatically sprout up into the morning sky, ultimately grabbing the attention of early risers and providing us with a perfect "Star in the East" adorning the predawn sky during the Christmas season. Editor's note: If you capture an amazing image of Venus with Regulus or the moon and would like to share it with Space.com for a story or gallery, send images and comments in to: spacephotos@space.com. Joe Rao serves an Associate at New York's Hayden Planetarium. He writes about astronomy for Natural History magazine, the Farmers' Almanac and other publications, and he is also an on-camera meteorologist for Verizon FiOS1 News, Lower Hudson Valley, NY. Follow us @Spacedotcom, Facebook and Google+. Original article on Space.com.